We know there are some great galleries around the Chippewa Valley, but what about when you blow through all those in a weekend and just need to see more art? Luckily, many public spaces have also been turned into full-on galleries. Here’s just a few of the public spots you can check out to find even more art around our great region. 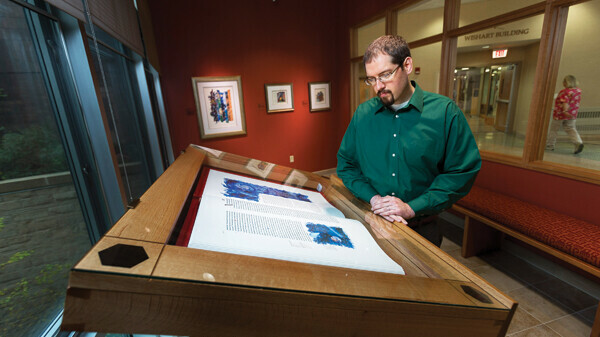 It was a pretty big deal when the St. John’s Bible Heritage Edition came to Eau Claire, but many may forget it’s still on display. The handwritten, hand illustrated bible is one of only a few in the world and is on display both at Sacred Heart and Mayo. While you’re there, both hospitals have plenty of other work by local and international artists. In Sacred Heart Hospital’s lower level there is a collection of paintings of Eau Claire’s historic homes from the Third Ward. At Mayo, check out a number of stained glass pieces from well-loved local artist Laurie Bieze, who passed away earlier this year. Lloyd Fleig and Claude Schilling are true champions of Eau Claire art. 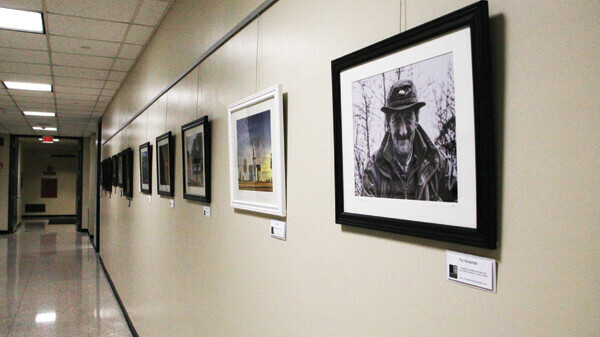 In addition to establishing an art program at the regional airport, they have arranged displays by local artists at the Eau Claire County Courthouse. The rotating shows have been photography heavy thus far, featuring a handful of local artists at once. Just around the corner from UW-Stout’s Furlong Gallery – which displays an ever-changing kaleidoscope of student and faculty art – is an almost-hidden piece of the university’s (and Wisconsin’s) past. As part of the Works Progress Administration – a federal program that gave work to artists during the Great Depression – painter Cal Peters worked at what was then the Stout Institute in the mid-1930s. 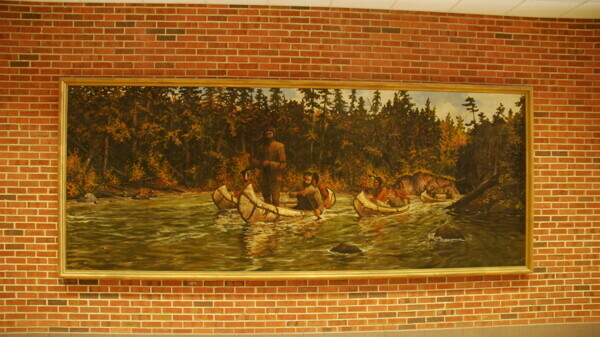 One of his murals, French Trappers on the Red Cedar, is a massive (7’ by 18’) painting portraying buckskin-clad voyageurs and Native Americans paddling along the river. 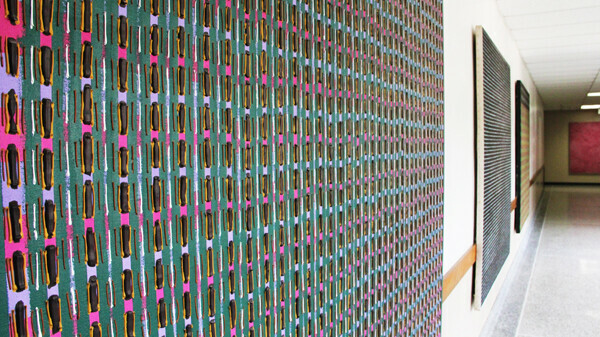 If you want to find this canvas, you’ll have to do some exploring of your own: From the atrium at the entrance to the Furlong Gallery in Micheels Hall, walk northeast toward the hallway that connects to the Jarvis Hall Technology Wing. Immediately before entering the other building, turn right down a brick hallway and you’ll see the impressive mural. Most people don’t go to the airport unless they have something specific to do, but that could change now that the terminal is a full-on art gallery. Last year the local airport began displaying local art – with the help from Claude Schilling and Lloyd Fleig – rotating out on occassion. Whether you go specifically for that or are delayed on your way out of town, it’s worth the time to wander and see some local talent. There’s art scattered across UW-Eau Claire’s campus: sculptures on the mall, photgraphy in the Davies Center, chalk art on the footbridge. 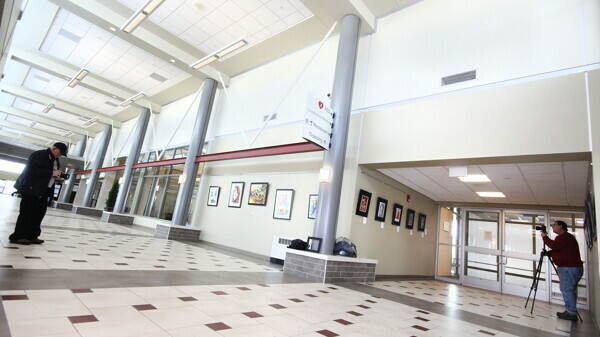 But one of our favorite spots is on the top floor of Schofield Hall, where local artist Tiit Raid – a UWEC professor emeritus – has four paintings displayed. Raid’s works are giant, abstract pieces using small geometric patterns exploded across the canvas. UWEC and CVTC students' guide to Eau Claire. This guide has everything from restaurants to parks to local music. Press and hold the up/down arrows to scroll.